The first card is colored using the Big Brush markers and this card shows you what the whole stamp looks like. Other that trimming the sides a bit this is the full stamp. I colored and blended on water color paper with the markers, trimmed out and matted the image and then stickled with yellow stickles to "highlight" the yellow areas on the card. Im my mind this is the "sunlight" hitting the objects on a fall day. The second card is colored with watercolor pencils. And this method is so easy and fast to do! I basically colored everything but the cornicopia, fence and basket yellow and then added appropriate blending colors from there. Once all colors added I pulled out a brush and cup of water and blended away. This method is nice as if you make a mistake you can use the water to "push" the color back or simply wait till the image is dry and then add more pencil again. 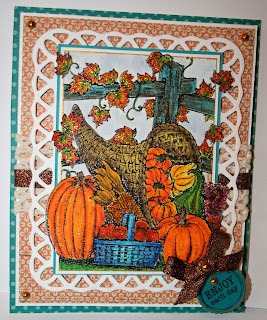 On this card I cut out the fence and leaves....mounted them first and then added the pumpkin/cornicopia section of the card on pop up dots. 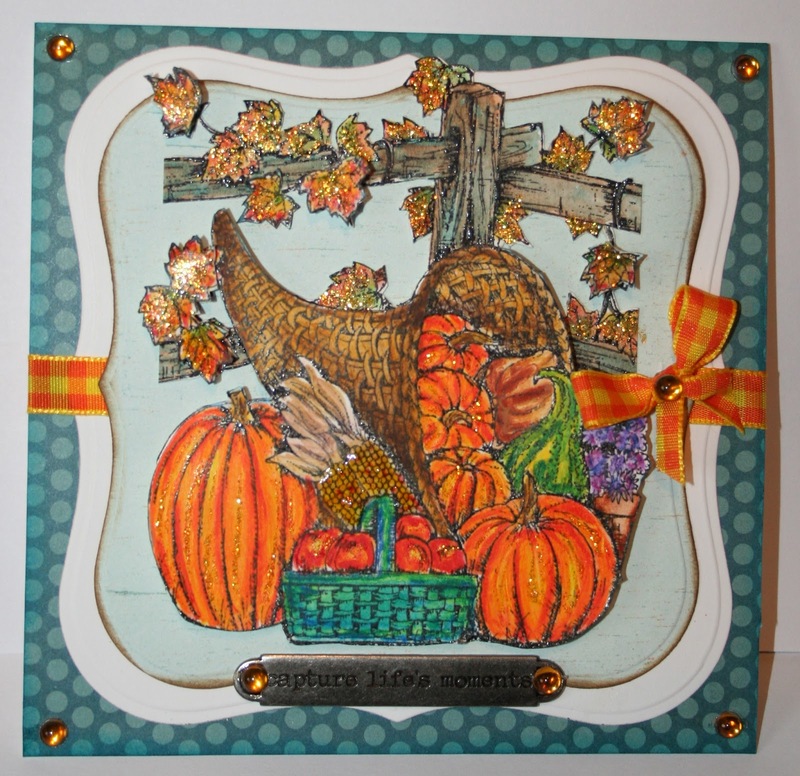 I also cut out several leaves that I had left over from the third card and popped them up on dots also. I added the brass sentiment that says "capture life's moments", stickled with yellow again and that card was done! Finally, the third card uses copics and again the process was pretty straightforward. The coloring here took substantially longer to color than either method listed above! I hand colored the ribbon with a Tim Holtz distress ink and now my fingers are impossibly turquoise. I never understand why that ink doesn't rinse off as it is water reactive......And besides stickling again I added a little brass tag that says "wander" as that is what I like to do in the Fall. Wander about in our state's glorious, colorful parks. Thanks for stopping by today! It was great to get back to the crafting table and I hope to be back with more cards this weekend. I hope you all are well and enjoying this lovely Fall as much as I am! It is soooo hard to be indoors now when I know that winter is coming, too soon, and the weather outside now is just fabulous! Beautiful cards, Sheila! I especially love the Copics one - soft and pretty. Wander is a great sentiment for this glorious season! The trees are just gorgeous here in northeastern Ohio. This IS a lovely stamp, Sheila! I agree that orange and turquoise are perfect together, as are those papers you've chosen. A really wonderful showcase of this beautiful time of year. As Joy says, we are seeing these colors in real life here - my favorite time of year! Incredible Sheila that one stamp can get such a different look with the colouring medium used. All are fabulous but I really like the first one. I think it is the frame behind it that makes it stand out for me. Sheila, these are ALL amazing and wonderful. I am so happy you showed me the Northwoods stamps when we were together. 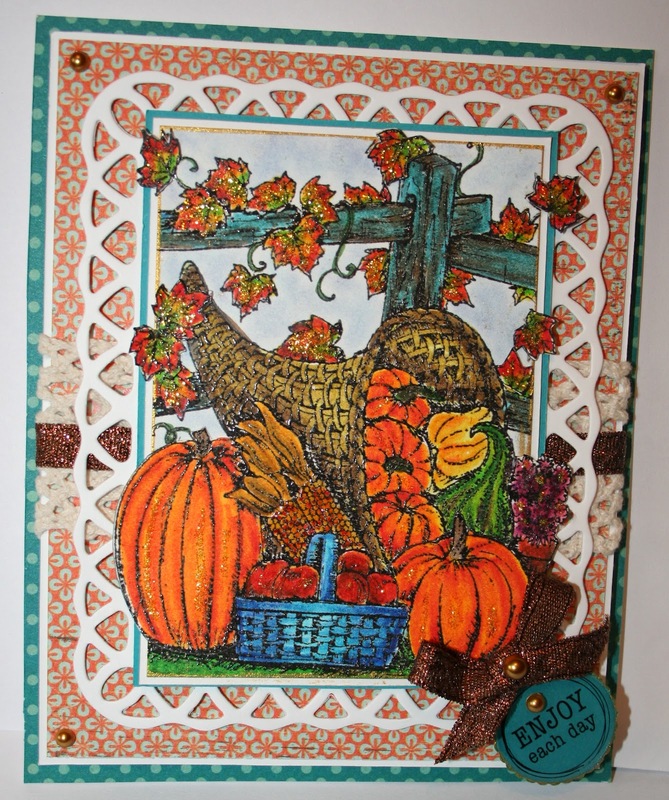 I love your choice of papers and embellishments! Wonderful adventures in color Sheila. It was fun to see all your techinques.